Each attendee with receive a Certificate of Attendance noting the number of hours of participation. Seats are filling up, REGISTER now! Your StrengthsQuest adventure begins with a 30-minute online assessment. Assessment instructions will be emailed to all registered participants. Please complete your strengths assessment by Monday, April 24, 2017 by midnight. After you complete the StrengthQuest assessment, you will receive a customized report that lists your top five signature themes. Please print your Strengths Report. 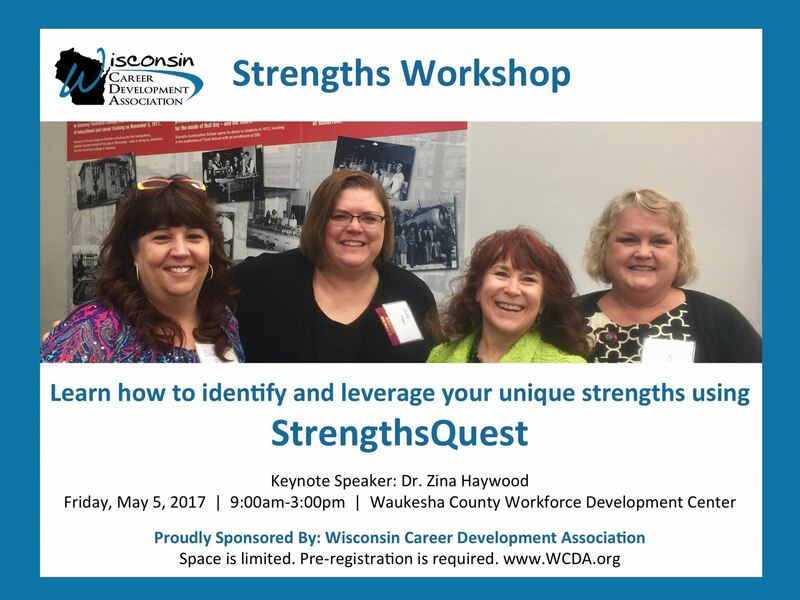 Bring your Strengths Report with you to the professional development workshop. StrengthsQuest focuses on developing strengths (rather than concentrating on weaknesses). Learn how to identify and leverage your unique strengths. Recognize and appreciate your strengths and the strengths of others using a strengths-based perspective. Identify how you like to work best and what you need do to work well with others. Learn how to use your strengths to maximize your work potential. Determine when to ask for help from others with different strengths. Create dynamic teams that tackle projects and problems. Use strengths as a powerful career development tool personally and in your work with clients. Location: Waukesha County Workforce Development Center, located on the WCTC Main Campus, 892 Main St. Pewaukee, WI 53072. View map. Meals: Light continental breakfast and lunch provided.